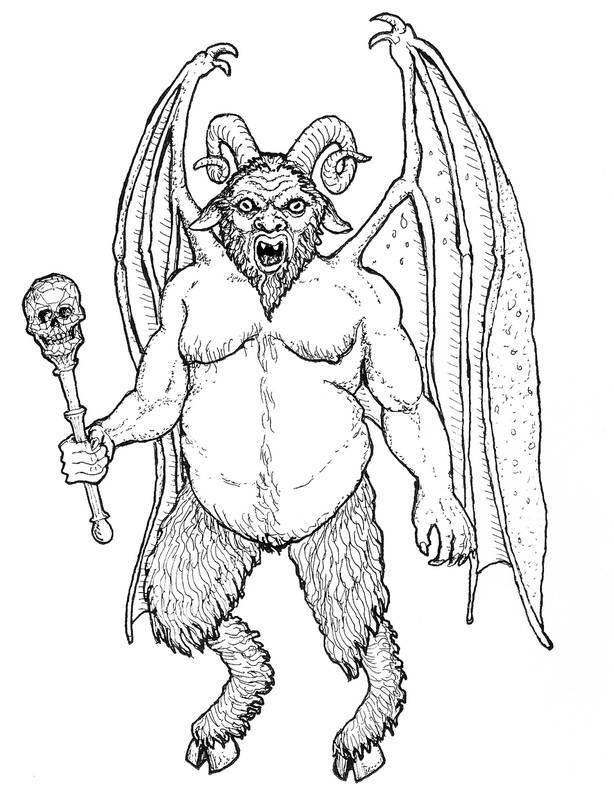 Maracus, grand nephew of the infamous demon Orcus, is a minor demon of impressive appearance. Standing at just over 6' tall and usually covered head to toe in a large violet covered cloak, he often greats travelers and adventurers with the line "Do you know who my uncle is!?!" before revealing his true visage. Those who claim ignorance will be regaled with tales of horror and humor, as Maracus, while evil by heredity, simply wants to be liked and he doesn't much care who does the liking. In truth, Maracus has been exiled to the prime material plane for the thought crime of not being evil enough. As such, he lacks many powers that most demons possess. He can fly* short distances (30' or so per "hop") and is immune to damage from non-magical weapons (although spells and spell-like powers work normally) and cast Charm Person (as the spell) once per day. Maracus' skull topped wand can cast any 1st level spell, magic-user or cleric, once per day. It can do this once per turn. The same spell cannot be cast more than once per day. In the hands of any other than Maracus, it has the same abilities but only one spell maximum can be cast per day. If encountered by a party of adventurers he will seek to join them, telling them that he is a skilled bard and storyteller as well as a ferocious warrior. The truth to such claims is in the eye of the beholder. This is weird and fun. I want to use him in a game. How big is Orcus' fam? Talk about a Skull & Bones society!